By Tom Kertscher, Dave Umhoefer on Wednesday, January 22nd, 2014 at 10:20 p.m.
Gov. Scott Walker and state Democrats fired volleys of numbers during the Republican’s "state of the state" speech Wednesday night, often without making truth a casualty. PolitiFact Wisconsin’s team drew that conclusion after hearing the two sides trot out claims we’ve previously fact-checked on the Truth-O-Meter. Walker accentuated negative economic numbers under his predecessor, Democrat Jim Doyle, while Democrats hammered on the slow pace of recovery in Wisconsin compared with much of the nation. Walker claim: "Thankfully, the days of double-digit tax increases, billion-dollar deficits and major job loss are gone." During the recall election in 2012, we rated Mostly True a Walker claim that Democrats in power before 2011 adopted "double-digit tax increases." There were not widespread double-digit increases in major taxes such as income taxes and the sales tax. But a variety of others — including cigarette taxes and the "combined reporting" business tax — rose by double-digit percentages. Walker claim: While discussing the projected $911 million budget surplus by 2015, Walker said: "Three years ago, we inherited a state government with a $3.6 billion budget deficit." We affirmed that figure as defensible in 2011, ruling False a claim by then-State Rep. Mark Pocan that Walker’s estimate was a "bogus" figure. State Democratic Party claim: The party sought to undercut Walker’s announcement on the surplus and tax cuts. It pointed out in a news release during his speech that "Walker’s first budget cut nearly one billion dollars from public schools and our technical college system that provides critical job training programs." That number is on target, we said in 2012 when rating True former gubernatorial candidate Kathleen Falk’s statement that Walker had "made the biggest cuts to education in our state’s history." 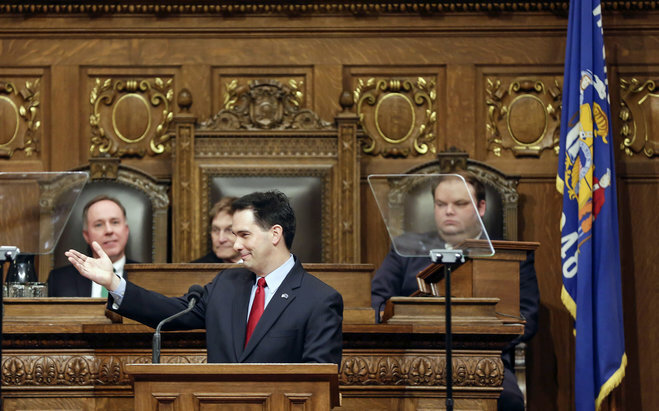 Walker and Republicans partially restored those cuts in the latest budget. Walker claim: "During my predecessor’s last term, Wisconsin lost more than 133,000 jobs." The number is correct. In September 2013 we rated a related claim by Walker, who at the time blamed that job loss directly on the policies of Doyle. We rated it Mostly False because experts agree that Wisconsin’s economy was caught in the same economic crash that crippled the entire country — the recession was deeper and more severe than any single state’s policies, including those of Doyle. Top Democratic lawmaker’s claim: Assembly Minority Leader Peter Barca of Kenosha, who gave a Democratic Party response, said that "Irresponsibly, Republicans chose to kick people off their health care — even though it cost Wisconsin taxpayers millions more." That’s an apparent reference to Walker’s decision not to accept federal funding to expand Medicaid. When Walker’s health services secretary said Wisconsin was "not walking away from a dime" by rejecting the Obamacare expansion, we rated the statement Mostly False, finding the state lost out on $119 million in 2013-’15. Walker claim: Walker mentioned several businesses were moving from Illinois to Wisconsin and said they like the Badger State’s stable fiscal situation compared with the Land of Lincoln’s. He claimed, "Unlike Illinois, our pension fund is the only one in the country that is fully funded." We rated that True as of January 2013, noting that Illinois was lowest among the states at 45% pension funding in 2010. Walker claim: In rolling out another property tax cut, Walker said that "if property taxes had continued to grow at the pace they did during Governor Doyle’s final term in office, the typical homeowner would have paid $680 more by the end of this term." This is a more accurate version of a recent Walker claim in which he tried to tie the $680 figure to a very modest earlier tax cut and didn’t disclose the $680 was a hypothetical calculation. We rated that claim Pants on Fire.